Location of Versailles in Ripley County, Indiana. Versailles /vərˈseɪlz/ is a town in Johnson Township, Ripley County, in the U.S. state of Indiana. The population was 2,113 at the 2010 census. The town is the county seat of Ripley County. It was decided in 1818 a county seat should be located at Versailles. The town of Versailles was laid out in 1819. It was named after the Palace of Versailles. A post office has been in operation at Versailles since 1823. 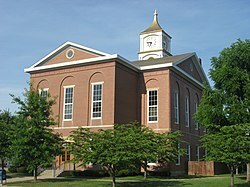 The Ripley County Courthouse, Fernando G. Taylor House, Tyson United Methodist Church, and Versailles School and Tyson Auditorium are listed on the National Register of Historic Places. Versailles is located at 39°4′3″N 85°15′18″W﻿ / ﻿39.06750°N 85.25500°W﻿ / 39.06750; -85.25500 (39.067624, -85.255026). According to the 2010 census, Versailles has a total area of 1.51 square miles (3.91 km2), all land. Laughery Creek is the major stream in the area, and was dammed in 1954 to form 230-acre Versailles Lake, within the Versailles State Park. As of the census of 2010, there were 2,113 people, 874 households, and 538 families residing in the town. The population density was 1,399.3 inhabitants per square mile (540.3/km2). There were 999 housing units at an average density of 661.6 per square mile (255.4/km2). The racial makeup of the town was 98.2% White, 0.2% African American, 0.3% Asian, 0.1% from other races, and 1.2% from two or more races. Hispanic or Latino of any race were 0.4% of the population. There were 874 households of which 31.0% had children under the age of 18 living with them, 42.6% were married couples living together, 14.4% had a female householder with no husband present, 4.6% had a male householder with no wife present, and 38.4% were non-families. 33.3% of all households were made up of individuals and 17.3% had someone living alone who was 65 years of age or older. The average household size was 2.32 and the average family size was 2.95. The median age in the town was 37.9 years. 23.6% of residents were under the age of 18; 10.6% were between the ages of 18 and 24; 24.5% were from 25 to 44; 25.4% were from 45 to 64; and 15.9% were 65 years of age or older. The gender makeup of the town was 47.5% male and 52.5% female. As of the census of 2000, there were 1,784 people, 746 households, and 492 families residing in the town. The population density was 1,168.9 people per square mile (450.2/km²). There were 803 housing units at an average density of 526.1 per square mile (202.6/km²). The racial makeup of the town was 98.82% White, 0.06% African American, 0.45% Native American, 0.17% Asian, 0.11% from other races, and 0.39% from two or more races. Hispanic or Latino of any race were 0.50% of the population. There were 746 households out of which 31.6% had children under the age of 18 living with them, 50.4% were married couples living together, 12.5% had a female householder with no husband present, and 34.0% were non-families. 31.5% of all households were made up of individuals and 16.1% had someone living alone who was 65 years of age or older. The average household size was 2.36 and the average family size was 2.93. In the town, the population was spread out with 25.7% under the age of 18, 10.1% from 18 to 24, 26.2% from 25 to 44, 22.2% from 45 to 64, and 15.8% who were 65 years of age or older. The median age was 36 years. For every 100 females, there were 83.9 males. For every 100 females age 18 and over, there were 84.0 males. The median income for a household in the town was $35,144, and the median income for a family was $41,442. Males had a median income of $31,607 versus $22,237 for females. The per capita income for the town was $17,352. About 8.3% of families and 8.7% of the population were below the poverty line, including 9.3% of those under age 18 and 6.8% of those age 65 or over. Most students in Versailles attend South Ripley Elementary School for grades K through 6 and South Ripley Junior/Senior High School for grades 7 through 12. The town has a lending library, the Tyson Public Library. Harry Wheeler, 19th Century baseball outfielder, was born in Versailles. ^ "Versailles, Indiana". Geographic Names Information System. United States Geological Survey. Retrieved 2017-03-05. ^ Wanda Lou Willis (9 October 2013). More Haunted Hoosier Trails: Folklore from Indiana's Spookiest Places. Emmis Books. p. 186. ISBN 978-1-57860-182-0. ^ Charles W. Cady (1846). The Indiana annual register and pocket manual for the year 1845: containing the names and residences of all judges and clerks of courts, prosecuting attorneys, recorders, auditors, ... Printed by E. Chamberlain. p. 138. ^ Gannett, Henry (1905). The Origin of Certain Place Names in the United States. U.S. Government Printing Office. p. 310. ^ "Ripley County". Jim Forte Postal History. Retrieved 30 November 2015. This page was last edited on 6 May 2018, at 23:32 (UTC).